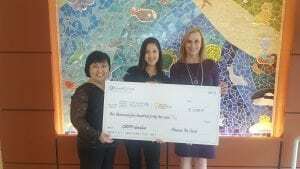 Amanda Friedeck from Hawaii Rx Card stopped by Kapiolani Medical Center to present Martha Smith, CEO and Joan Kanemori, Director of Pediatric Services with a check for $2, 542.75. The Hawaii Rx Cards donate 5 cents to Kapiolani Medical Center for every transaction. Since 2015, United Networks of America and Children’s Miracle Network Hospitals have partnered across the U.S to raise more than $1 million for the 140 member hospitals in the United States, with local hospitals allocating funds how they are needed most. Making a donation with each processed transaction allows the UNA state card programs to be set apart by giving back to their local CMN Hospitals. The UNA Rx Card is a free prescription drug card, that allows consumers to save on generic and name brand medications. This makes prescriptions more affordable for the uninsured and the under-insured and can be used to supplement most health insurance plans. The card is accepted at many major pharmacies, including CVS pharmacy, Walmart, Walgreens, Target, and Safeway. Next post: Meet the 2018 Ace All Star(s)!